Anyone who’s familiar with the story of Hansel and Gretel can probably picture in their mind the famous cottage at the heart of the tale. In many versions of the story, that house is made bread and cakes — not exactly a practical building material in most parts of the world. However, the Hansel and Gretel story has inspired a real-world building style. Hansel and Gretel houses are known for their mystery, warmth and charm. One of their most prominent features is a wooden roof with rounded eaves, gentle waves and a strong sense of harmony with nature. Wooden roofs with these qualities are difficult to get right. Specialized expertise is required to carefully shape cedar or teak shingles into formation, and to retain a consistency of quality on a piece-by-piece basis, while keeping in mind the overall aesthetic impact of the finished product. Custom Shingles is a longstanding provider of customized wood roofs of all styles. We are unique in our ability to steam-bend and shape wooden shingles by hand — an essential step in creating an authentic Hansel and Gretel-style roof. Using innovative, creative designs and high-quality materials, we build homes that are the envy of their neighbors. Check out our blog to see some of the work we’ve completed for demanding customers around the world. 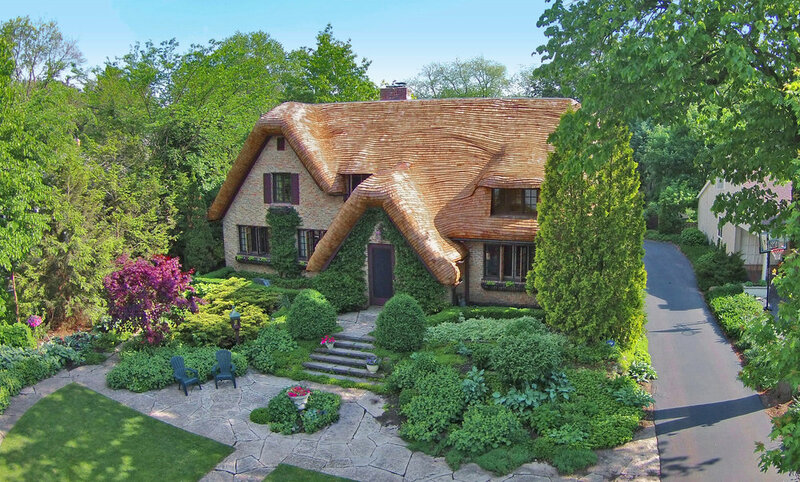 High-quality wood shingles are a critical component of any Hansel and Gretel roof. Custom Shingles offers a number of products, including cedar, teak and Royalwood™ Wallaba shingles and shakes, that can be shaped and bent to the specifications of your design. Our ability to hand-form wooden roofing products is one of the main reasons why we’re frequently called on to complete historical restorations and luxury villa projects for customers around the world. When it comes to your home, that’s a pedigree you can trust. With the amount of handcrafting involved, a Hansel and Gretel roof is a big investment for any homeowner. However, it’s well worth it. Let our expertise turn your dreams into reality. We offer design support and can even travel to your location to oversee the installation of your roof. Because cedar shingles require additional care, we can also provide extended maintenance and other services to protect against moss buildup. If you’re considering adding a Hansel and Gretel roof to your home, contact Custom Shingles first. Often, we can provide you with a preliminary estimate using only a few photographs of your property. Call or email to begin the process today.